This week the challenge is Tag it! Here is card for the challenge using Tim Holtz products. I started with sponging Pine Needles, Ripe Persimmon and Gathered Twigs on Tim Holtz’s Festive layering stencil. Then I die cut a tag using Pretty Pink Posh’s stitched Duo Banner die. I also die cut a vellum tag using using the same die for an over lay. On top of the vellum overlay I have added wreath with two birds and bow from Simon Says Stamp called Chisholm Wreath. I die cut all the elements in the die set using white cardstock, then sponged the different elements with distress inks. The wreath with Gathered Twigs, the birds with Festive Berries distress ink and the bow with Delicata Gold ink. 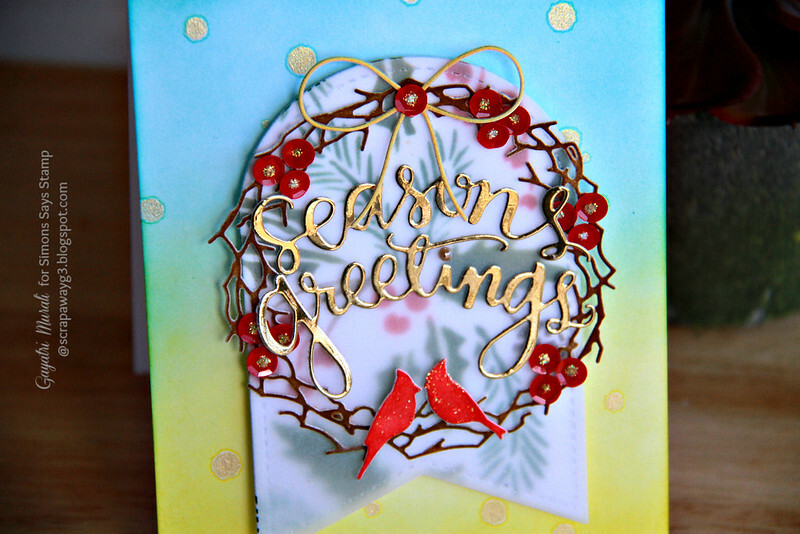 The sentiment is die cut from gold foil cardstock using Simon Says Stamp Season’s Greetings die set. On the card front, I sponged Crushed Olive and Peacock Feather distress ink with spatters of Heidi Swapp Gold Color Shine. I then mounted the layered tag on the card front using foam adhesives. I finally embellished the wreath with Pretty Pink Posh Raspberry 6mm sequins with Diamond Stickles in the middle. Gorgeous card Gayatri 🙂 I just LOVE the wreath so pretty and the shaped tag with the vellum overlay looks absolutely fabulous! 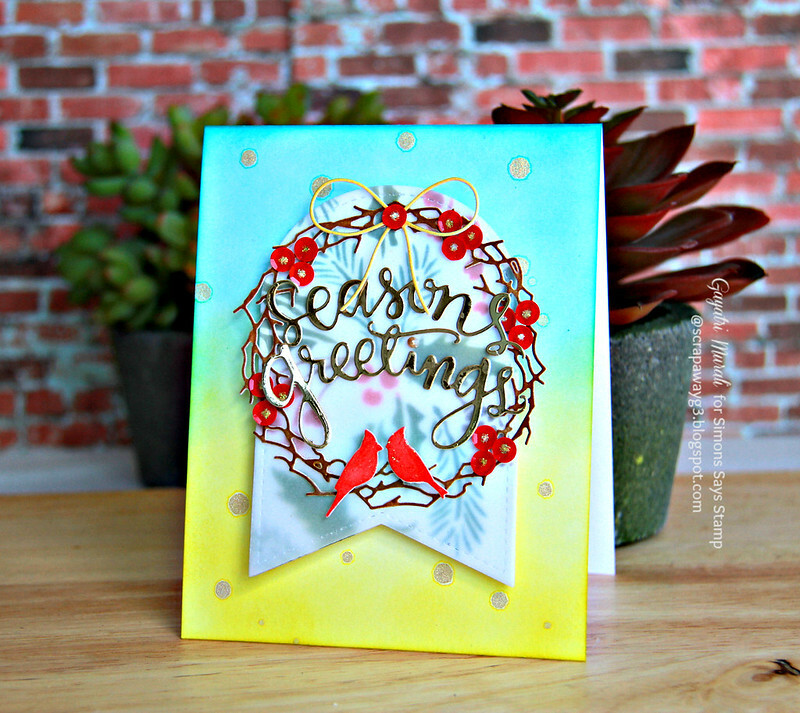 The die cut sentiment is fabulous – love the layered details – gorgeous. Love this wreath with the sweet birds, Gayatri, and how the vellum softens the stencilled design below it! A gorgeous card Gayatri, a lovely embossed background and a super stencilled tag under the vellum. Your die-cut wreath and sentiment are beautiful!! Beautiful card, Gayatri! the wreath is totally awesome! WOW! Such beautiful & bright colors!! Gorgeous card! hello Gayatri! sweet background, luv the wreath you created too…very pretty. hope you have a fabulous weekend! Beautiful tag. Love the gold foil wreath. Just had to pop over from Simon Says Stamp to say that I absolutely love this card! !